Quick planning, easy meals this week. I didn’t make this last week, but I did get the pork out of the freezer, so I need to make it now. Also, I am using some of the tomatillos from the garden! A friend is coming over to practice crafts for the crafting party, so this should be relatively quick and easy. I will be winging this recipe. I am guessing there will be some kale in there, since I have that growing outside still. If it turns out well, I’ll post a recipe. The broccoli is still growing out in the garden, too! Pizza, because I want the kids to love me, ;). Saturday is the kids crafting party so I am not sure what we will do that night. 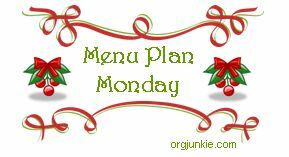 This post will be linked up on orgjunkie.com for Menu Planning Monday.